Water level controller using 8051. 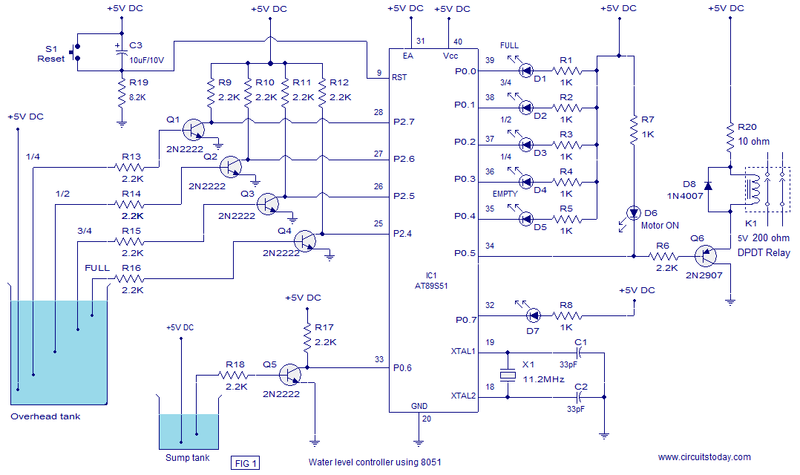 A water level controllerÂ using 8051 is shown in this article. A lot of water level controller projects have been published in this website but this is the first one based on a microcontroller. This water level controller monitors the level of the over head tank Â and automatically switches on the water pump when ever the level goes below a preset limit. The level of the over head tank is indicated using 5 LED’s and the pump is switched OFF when the over head tank is full. The pump is not allowed to start if the water level in the sump tank is low and also the pump is switched OFF when the level inside the sump tank goes low during a pumping cycle. 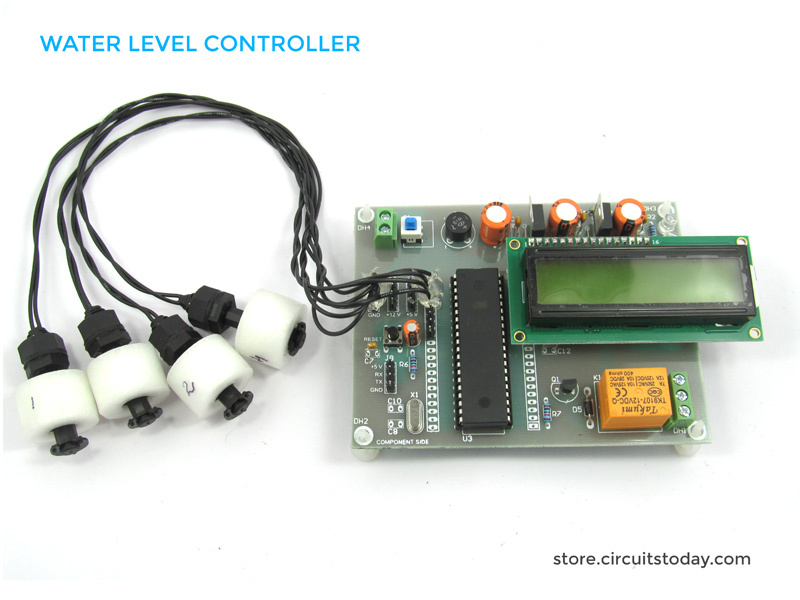 We are selling a Project Kit for this Water Level Controller which can be bought from our Online Store. The project kit is a modified version of the project shown above. This Water Level Controller project kit uses 4 float switches to measure water level. The status of water level in the tank and status of the motor is displayed using an LCD module. This system monitors the water level of the tank and automatically switches ON the motor whenever tank is empty. The motor is switched OFF when the overhead tank or container is FULL. The use of float switches makes the circuit rugged and ensures a maintenance free operation over a very long period of time. The project kit is available in plug and play form and do it yourself form. A 12-0-12 mains transformer is also available with the kit and it is not shown in the figure below. The level sensor probes for the overhead tank are interfaced to the port 2 of the microcontroller through transistors. Have a look at the sensor probe arrangement for the overhead tank in Fig1. A positive voltage supply probe goes to the down bottom of the tank. The probes for sensing 1/4, 1/2, 3/4 and FULL levels are placed with equal spacing one by one above the bottom positive probe. Consider the topmost (full level) probe, its other end is connected to the base of transistor Q4 through resistor R16. Whenever water rises to the full level current flows into the base of transistor Q4 which makes it ON and so its collector voltage goes low. The collector of Q4 is connected to P2.4 and a low voltage at Â P2.4 means the over head tank is not FULL. When water level goes below the full level probe, the base of Q2 becomes open making it OFF. Now its collector voltage goes high and high at P2.4 means the tank is not full. The same applies to other sensor probes (3/4, 1/2, 1/4) and the microprocessor understands the current level by scanning the port pins P2.4 ,P2.5, P2.6 and P2.7. All these port pin are high (all sensor probes are open) means the tank is empty. Port pin P0.5 is used to control the pump. When ever it is required start pumping, the controller makes P0.5 low which makes transistor Q6 ON which in turn activates the relay K1 that switches the pump. Also the LED d6 glows indicating the motor is ON. LED D7 is the low sump indicator. When the water level in the sump tank goes low, the controller makes P0.7 low which makes LED D7 to glow. The circuit diagram of the water level controller is shown in the figure below. Moisture Sensing Automatic Plant Watering System – is an interesting project for hobbyists and students alike. This projectÂ is designed as a DIY automatic plant watering system based on soil moisture. Soil moisture is sensed using YL69 moisture sensor and 8051 microcontroller is used to interpret the sensor data and turn ON/OFF a motor pump for watering. Can you please tell me the name of all the components that are used to build water level indicator using 8051 microcontroller ? I am going to prepare a project over this topic so kindly tell me as soon as possible. I highly need instructions about this. Also where can I get all these components from ? Dear Sir , Kindly inform me how can I use the project kit without Sump Tank. The connection diagram needs to be modified at some regions. Can anyone send me the correct coding please…..
SIR I HAVE IMPLEMEMNTED THE CIRCUIT BUT WE CANT GET OUTPUT . PLEAS HELP ME OUT. I THINK THERE IS A AN ERROR IN PROGRAMME. can we use 89c52 instead of 89s51…. i need to use 5v 220ohm relay?? ?this cct is ok?? Sir i do automatic water level controller Using 8052 (at89s52) as per ur circuite but program is not working,Please help me and send me correct program. Here is the program in c for above circuit, it’s as simple as it can be, easy to under stand. note: kindly use the same port numbers used in this program. on which application i should run the code. Just me going through the diagram thought to myself that it could be useful to get a list of components with exact details, am new to it so quite challenging that is for me now, for example that X1 is 11.2MHz its only specification ? And one more thing, does the relay has to be 200ohms ? hard to find one, biggest I seen in this voltage is 170 and out of stock at the moment, available 67ohm, is there way around, let me know ASAp please. Can anyone tell me how does this motor works ? Sir, I constructed this circuit and its working fine. But I am worried about power supply circuit, will it be able to work 24×7 the whole year? And which is better, using a transformer or a smps power supply along with voltage regulator? Pls,i want to carry out this project help me with materials.Thank you,Sir. Why that program is not correct? Always at ” MOV P0,#11111111B // initiates P2 as the output port “. can u send me the proteus view of this circuit? plz. Can anyone plzz send me the correct program file for this project because given program is not working. By setting P0 to 11111111B, the cathode of LED is floating (high impedance). This is open drain configuration? Can anyone plzz send me the c language program of this water level project as i hav to merge it to control gate. Can you please send the whole code/program( in C language if possible) and flowchart? Thank you. sir send me more information about this project. Sir could u please send me more theory and progrm for my email…thanks for the advance..
hello sir,could you please send me full program on above 8051 water level sensor? plz..do send me more information on this. Please send me hex file of water lever controller on my email address I am very thankful to you. We are interested in doing this project on water level indicator using 8051 micro controller…Sir can u please send further details and much more information about this very topic. I am very surprised with your circuit posted; but how we can change the programming language used here to c-language program ? 10 Q 4 ur consideration!!!!!!!!!!!!!!!!!!!!!!!!!!!!! I want to review ur program plz send me ur program & I want to know that did u any change made in this circuit? Sir,can you give more detail about circuit diagram and how should we connect motor.or can you give simple circuit diagram to connect i/p and o/p in microcontroller and water tank and motor. sir i want to know about this project.please send me the detailed explanation about it. Dear Friend , Can i have the full program for this “Water level Controller using 8051” . can i have it sent to my email . Thank you very much please . I want to more information about water level controller using 8051 pls sir send me info. to my mail. Thanks…. sir what type of software was used for this program. nice info.. thank you for such regarding content..
after burning this code output never toggle’s with change is input is there any correction in code?? hi. i need full program level controller using 8051 . so will u plz send to my mail id. hi bro…did u get any full program from admin? I want to make project on water level measuring , monitoring & controlling.so please give me more information about it. u need to give connection to a step up transformer in order to run the motor. Hello.can I please gt a complete report on how to make the water level controller? I m very new to the concept of microprocesormand microcontroller.can I please now wht exactly are sensors? I want 2 know the detail information about ‘water pump operated on mobile’ for my project, pls snd it on my mail. Can anyone please tell me the connection of relay with the motor if it is to operate at 220/240 V ? Pls can you snd a display pix of urs to my mail. Pls apart from d code modification, wht other modification did u do? can you send me the true program? please provide me more information about water level sensing and how probes does the job in sensing the water. Please explain the principle of sensing the water level at various level. sir i want to know that can i use pic c compiler for this coding . if not which compiler i can use for generating its hex code or else u provide me the hex code. Respected sir, This circuit is very very good but i want to use this circuit with main water line (when the water is available in a line . the motor will start automatically? I have convert program in to hex file & load it, but it’s not working. So if you give me hex file for the same ckt than it will helpful to me. if i use this program to picaxe as it is . will it work. is there any problem if i use picaxe instead of microcontrolle. this water level circuit 8051 is very good. can you add under ground water pipe line water sensor. when the water comes in the under ground main pipe line. the moter will start automatically. can i get the embedded c program for this water level controller? can i used a at89s52 instead of at89s51? hello,i need the complete procedure in implementing water level indicator using 8051 with Multisim software. would u plz let me know what short of precaution need to be taken for the water taken for use from the over head tank, as it is holding continous +5dc supply. also getting trouble in connecting the relay & the motor. i have some questions : 1- are the sensors are copper wire with 2.2k ohm? 2- i use proteus program designer which require hex file and when i put the code in compiler there are many errors??? 3- in the simulation (proteus)what i put instead of water ?? there is a mistake in your code the second line of the code..
not kindly check it back & reply with your comment. any hot the design is good. Hello Abdul, you just cant replace 8051 with PIC or any other micro controller like AVR. The reason is difference in “hardware architecture”. You can consider replacing the AT89S51 (from Atmel) microcontroller we have used in the circuit with other controllers of similar architecture – say AT89c52 or some other controllers. The controller must be compatible with MCS-51 instruction set too. If you are planning to use PIC, you can do so by rewiring the circuit in accordance with PIC architecture. You will also have to rewrite the codes based on PIC instruction set. ould you pls explain to me that where do we connect the -ve terminals. and i am also confused abt the connection of the motor which pumps the water. Your doubts are not that clear! Can you be more specific ? If you are talking abt the “ground” terminal, then all terminals with a standard “ground symbol”, can be wired together as a common ground. i mean how to connect motor and relay and how do i generate -ve voltage for starting microcontroller. plz explain in detail. I am a new user. what are the procedures for converting c file to hex file using MIDE 51 . tell me in detail. I didnâ€™t manage to program the AT89S51,but was able to connect all other components. Can you please assist with the one you have already programmed and worked for you? You can reach me via my email. this is very interesting. thank you for sharing this with all of us. unfortunately i am still in my freshman year of college and have not studied micro-controllers in so much depth. could you pls explain to me that where do we connect the -ve terminals. and i am also confused abt the connection of the motor which pumps the water. hi, can u post “Remote Controlling of Home Appliances using GSM (SMS Technology)” project?? Its simple and easy….i took Rs 400 for me to construct this project….love it…thanks…. hi.im from kenya and an engineering student i wanna kw more abt this project..can we be in touch personally.my email is musti786110@hotmail.com..ur rep will be much appreciated.thanks!! hi Santosh can you give your contact details…I need help to make it. If i use IO card for input to the circuit or check the conditions then which type of IO card i should use i.e pull up (active high) or pull down (active low). It is possible to use ULN2003 IC in the place of the transistors i think by using this ic we don’t have to use resistance and with the help of it circuit will became compact & more easy , is i am thinking write ? please tell me sir/mamm and can we also use a LCD screen to display the levels of water in the tank and when the tank is FULL will display on screen then a alarm will also run. what u think please tell me. i have no problem to use LCD for display the water level of tank i know its interfacing as well as programing with controller. but the real problem is how to USE IC ULN2003 at the place of transistors.and i think by useing this IC ULN2003 the circuit became more compact and cheaper. Is i am thinking right please tell me. Please try to think this circuit with IC ULN2003. we can use ULN2003 instead of transistors no problem with it. if you use ULN2003 the pull-up resistors are not required. pls giv the other app of this project. What is that component,X1 11.2MHZ? And do i use IC used in the circuit diagram ie IC1 AT89S51 OR 8051,what the difference? want to be sure before purchasing one. Please also assist me on how to instal program in an IC. If need be,you can use my email. 8051 is the first micro controller developed by Intel, where as AT89S51 is a version of 8051 (with many advanced features) from Atmel. You may refer data sheets of AT89S51 and 8051 to know differences between both. I would recommend to buy AT89S51 (because you can use it for a wide variety of applications compared to 8051). You can program AT89S51 using an In System Programmer (ISP). I didn’t manage to program the AT89S51,but was able to connect all other components. Can you please assist with the one you have already programmed and worked for you? X1 is a crystal , it is used for generating the clock pulse for 8051. 8051 is a general name and there are a large number of controllers belonging to this family. AT89S51 is one specific IC belonging to this family.You can use AT89S51, AT89C51 or anything like that. Go through the datasheets of these ICs for better understanding. AND YA u may forgot to connect all 2.2k (R9,R10,R11,R12) to connect at Vcc +5 AT Upper terminal which is floating right now………. There is no problem in using CJNE A,#11110000B,CJNE A,#11111000B,CJNE A,#11111100B,CJNE A,#11111110B. when touches a particular probe, the corresponding transistor goes ON and the corresponding input port pin goes low. I cannot fully understand what you mean. Is your doubt related to input interface or the comparison logic using CJNE. Pls make it clear. Any way i have again tested the circuit in real world and it works fine. Firstly 1s are written to all Port 2 pins. Suppose there is 3/4 level in the tank, then the condition of the port2 will be surely P2.0=1, P2.1=1, P2.2=1, P2.3=1, P2.4=1 and the rest will be zeros. I maid this project for my home automatic water level detector and maintainer.but your code have mistake as i already told you. you should have to check it one again. i changed it and my project is running now success full at my home ……… so plz take a note of it. is this program running without error? And i want to know about connection of motor with relay. Sir, plzz mail me the correct program for this project as soon as possible ! And also send the more information about project..